This piece appeared in The Big Issue in March 2015. Build more houses. It’s the hollow mantra of politicians across the board. Last week Natalie Bennett became the latest party leader to come up with a wild, meaningless promise – 500,000 new social rent homes – without anything like a convincing explanation for how it would be done. It’s easier to repeat the mantra than to acknowledge in any detail where things have gone wrong or why we’re currently losing social housing. Or to acknowledge some people are winning at the expense of those losing out. Or to make any bold choices about priorities and who is most in need of help to at least begin to ease the crisis. 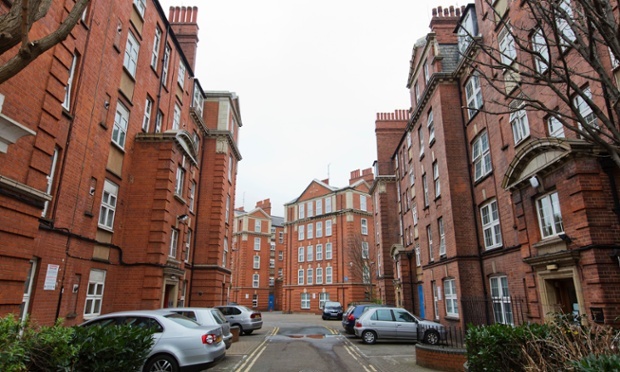 Anyone interested in understanding the strange twists and turns of Britain’s wonky housing market might be advised to take a stroll through Chelsea’s SW3 district and find some handsome red-brick tenements marked ‘Sutton Dwellings’ (pictured below). It would be easy to assume fairly well-off people live there. Jane Asher has a cake shop below some of the flats. Charles Saatchi’s gallery is a few minutes along the road. And the tenements look similar to many of the Victorian and Edwardian mansion blocks found across wealthy west London. But the Sutton Dwellings form a social housing estate. The blocks were built back in 1913 at the behest of philanthropist William Sutton, a Londoner who made his fortune in parcel delivery. He wanted to provide “houses for use and occupation by the poor”. His wishes were fulfilled for more than a century. Yet most of the estate is now set to be torn down. Today’s incarnation of Sutton’s trust is a housing association known as Affinity Sutton. It plans to create a new kind of estate by demolishing 13 of 15 blocks and shift the nature of the tenure. The existing 462 social housing flats will become 318 flats for social rent and 106 flats for private sale. So the redevelopment will see the loss of affordable homes and open the place up to overseas investors eyeing up any slice of the Chelsea playground deemed ‘luxury’ (people not particularly interested in architectural history or intention). Long-standing tenants are incensed. Ian Henderson, one of the leading lights of the Save the Sutton Estate campaign, talks about the “social cleansing” of the area. He has lived on the estate for 15 years. He pays £114 a week for a comfortable one-bedroom flat here (the private letting agency round the corner wants £525 a week for a one-bedroom flat). “It’s been such a lovely place and it’s been home to such a good mix of people – families, old people, key workers like teachers and posties,” says Henderson. “Why would you want to ruin that? Even the poshos are feeling the pinch. As foreign money continues to flood into Kensington and Chelsea in search of a safe haven, high-end independent handbag shops and hat makers are priced out by escalating rents. And the distortion in property leaves the native rich unable to afford quite as much for their money as they would like. So who rightly belongs in Chelsea? Affinity Sutton is keen to point out the remaining Sutton Estate residents (some have died or moved away) will all be re-housed on the new development and will keep their social rent tenancies. It says four of the existing blocks fall below the government’s Decent Homes Standard, so the only way to secure its own future in the area is to open up a portion of the land to the private market. “With no public funding available for this type of redevelopment or for refurbishment, the only way that we are able to do this is through adopting a cross-subsidy approach,” a spokeswoman explained. There are wider patterns at work. Social housing is being prodded, choked and squeezed out across the country. Research by the Chartered Institute of Housing shows that the stock of social rented homes in England fell by a staggering 43,850 in 2013-14. Some of that loss is down to council houses flogged off under the Right to Buy, but 26,918 social rented homes were lost to ‘affordable rents’, much better described as near-market rents, since they allow housing associations to charge 80 per cent of local private rates. In 2010 housing associations accepted the ‘affordable rent’ model, since government subsidies for new homes depended on their acquiescence. Bodies such as Peabody, the Guinness Partnership and Affinity Sutton – which owe their legacy to 19th-century philanthropic endowments – are not immune from these forces. Every knock-it-down-and-start-again regeneration scheme gives them the chance to raise market revenue and change tenancy types. It’s a strange kind of trickle-down approach to housing: get what you can from an overinflated market to help subsidise people on low incomes. In the case of the Sutton Estate the approach is startling because it involves smashing up splendid buildings expressly constructed for people on low incomes. What are social landlords there to do? What should we expect their architectural ambitions to be? It raises all sorts of questions. What are social landlords there to do? What should we expect their architectural ambitions to be? Come to think of it, what kind of housing do poor people deserve? Is it inevitable that they remain at the back of the queue while the wants of those with money to invest or trade up are prioritised? Have the zeal and high aspirations of the Victorian social reformers – who aimed to improve lives by raising the standard of the built environment – gone missing? In fast-gentrifying Brixton another philanthropic legacy is under question. The Guinness Partnership is about to demolish 390 social housing flats at Loughborough Park: an admittedly mediocre, five-storey, brown-brick estate typical of the interwar years. The planned replacement – a mediocre, six-storey estate of brightly coloured cladding – will be made up of only 211 homes for social rent, 143 for affordable rent and another 133 for shared ownership. Beitel Mehari, 42, has lived on the Guinness estate for 10 years. She faces an uncertain future. Beitel and a small group of other residents (pictured below) have occupied one of the empty flats in protest at Guinness’ refusal to re-house people (like her) on ‘assured short-hold tenancies’, people without lifetime rights. The occupiers enjoyed a partial victory last week when Guinness agreed the remaining residents should at least be allowed to apply for other Guinness properties in London before the Loughborough Park flats are torn down. The past always tempts us to put on rose-tinted spectacles. It’s worth pausing to remember the context for Britain’s first social housing estates of the 1860s and 1870s. Developments planned by the philanthropic trusts of the 19th century were usually aimed at clearing away the worst streets and housing the ‘respectable’ working class. When the old slum districts were demolished many of the very poorest could not afford the deposits or rents on the smart new tenement estates – and ended up traipsing off to find affordable squalor in slums elsewhere. Charles Booth, the social researcher who marched around London colour-coding its streets by social class (properties marked black signified “vicious and semi-criminal” types – pictured below) believed clearance allowed the poorest to re-make their lives in a new environment (he didn’t always specify where). Or so he hoped. There are echoes in today’s consensus about ‘mixed development’ which holds dear the idea mortgage-owners and market-rent payers will be a quietly civilising influence on social-housing tenants, either dispersed during council-housing estate clearance or made less dominant by changes in tenure. At the risk of romanticising a different age, the rise of council housing replaced the need for Victorian philanthropists. In the 20th century we became accustomed to public housing as normal and necessary. For many decades it accounted for half of all construction. Housing didn’t have to be given by rich benefactors. It was simply the duty of our elected representatives. But council housing has been denigrated for many decades and for many reasons. The most damaging development was the failure to replace houses sold off under the Right to Buy (councils weren’t allowed to spend the money they earned, and central government funding for house building was slashed). They have been used to shift us away from social housing as normal to the housing of last resortEileen Short, chair of Defend Council Housing, mourns the fact that Britain’s public housing is now largely in the hands of housing associations. “They’ve become a vehicle of privatisation,” she says. “They have been used to shift us away from social housing as normal to the housing of last resort. And effectively they’ve become businesses – mergers, bond issues and for-profit development arms. If there is a lesson to be learned from looking back at the philanthropists it might be this: high ambition for the ordinary man. The Sutton Estate was one of the many of social housing estates built to feel like the equal of private homes around them. It’s a long time since anyone in power treated people who aren’t on the property ladder as equals.